Our commitment to you, the angler, is ensuring that you have the best experience in our stores and out on the water. For 2019 and beyond, SCHEELS has implemented a new rod warranty that we would like to clarify to enhance your buying experience.SCHEELS Outfitters branded rods are warrantied for 3 years against workmanship, materials, and/or breakage under normal fishing situations. 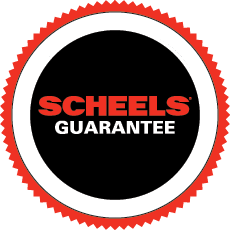 SCHEELS will replace any rod round to be defective due to materials or workmanship during this 3 year warranty period. SCHEELS will issue a credit at fair market value of the defective rod to be used towards the purchase of a new SCHEELS rod. Proof of purchase is required to complete a warranty claim. We know that accidents do happen and if within 3 years of the purchase date your SCHEELS rod does break by accident, SCHEELS will replace the series of rod being returned at 50% off of the current retail price. Rod breakage due to the result of normal wear and tear beyond 3 years will not fall under the SCHEELS warranty. The warranty is null and void if the rod is misused, abused, or altered in any way. SCHEELS Outfitters rods purchased prior to 2019 will carry a limited lifetime warranty against manufacturers’ defects. Any replaced rods will transition to the 3 year warranty against workmanship, materials, and/or breakage under normal finishing conditions. Rods purchased as part of a combo (rod/reel together) will follow the above guidelines. These items may be warrantied individually. Please note that SCHEELS reels carry a 1 year warranty against all defects against workmanship, materials, and/or breakage under normal fishing situations. For additional information about a SCHEELS Outfitters rod warranty claim, please contact one of our SCHEELS Fishing Experts at one of our 26 store locations. Will my replacement rod have a lifetime warranty? No, from 2019 and beyond any rods replaced will transition to our new 3 year warranty against workmanship, materials, and/or breakage under normal fishing conditions. What if you don’t make my rod series anymore? Upon return, if the rod series is not currently available, SCHEELS will issue a credit for the fair market value of that rod. Then the customer can use that credit towards the purchase of any new SCHEELS Outfitters rod. If my rod breaks and it was my fault, does the 50% off a new rod only apply towards the same rod I am returning? Yes, if the new rod breaks during the 3 year warranty period, you would receive 50% off of the rod series being returned, not 50% off any other series of rod. Does this new 3 year policy apply to SCHEELS combos as well? Yes it does. For all SCHEELS Outfitters branded rods, the 3 year warranty will apply. For any reels as part of the combo, the reel itself will carry a 1 year warranty against manufacturer defects unless stated otherwise.